The commissioning process usually begins with the initial contact from the potential client and is followed by either a meeting in your home or a visit to the workshop. The first meeting allows us to discuss your requirements, design ideas and any materials you would like to incorporate into the finished piece as well as the budget in more detail. The second stage of the process is the production of drawings and possibly a marquette to illustrate the designs. For new clients there is a charge of £160 to cover the time and costs involved, this is however refunded on the final price of the piece. The design drawings are sometimes redrawn or amended after your input, and once we have drawings that you are completely happy with, then an exact cost can be given. A deposit of 50% is payable at this point and an approximate delivery date agreed. The final payment is payable on completion and delivery of the piece. You are encouraged to visit your piece whilst is is being crafted and it is possible for fine changes to be incorporated at this point. 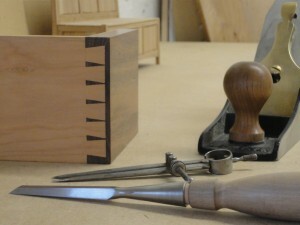 Once the piece has been completed contact will be made to arrange its delivery at a time to suit you. If you are interested in commissioning a piece of furniture or would like more information, please do not hesitate in making contact. Simply fill in the form below and I will contact you as soon as possible. All correspondence will be dealt with confidentially. To view this piece and a variety of other commissioned pieces, please visit the portfolio section. Thinking of Commissioning a Piece of Furniture? 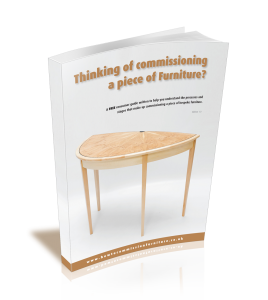 Download this FREE consumer guide to commissioning furniture. In this fact filled guide you will discover. This FREE consumer guide was written to help you confidently navigate the exciting and highly rewarding process of commissioning bespoke furniture. By using the information provided by this guide you can go on to make an informed, intelligent decision.